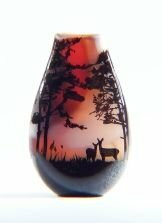 Silhouette of a typical country scene on a small vase - Gift Voucher available. Our scenes our created through different layers of coloured glass using the hot glass process. Once annealed, the piece is then masked with individual unique designs and carefully sandblasted. This process reveals the sky beneath and creates a relief of the silhouette scene. Each piece is handmade from start to finish, with each piece distinctive and can be made personally for you.